Royal Gems Golf City is Asia's first replica course and combines 9 of the best holes in the world with the back nine of Augusta National. They really have done a fantastic job on this course. The Service, facilities, course, setting and overall golfing experience is very very good. Having just reopened (May 2012) after the great floods in December 2011 the developers have done a great job recreating some of the world’s best holes. Not to mention the experience of playing some of those holes you have dreamed about or seen on TV. Imagine playing hole number 2 a replica of Bay hill Florida’s narrow fairway, Oakmont’s hole 3 with the famous church pew bunkers to your left or on hole 10 try to recreate the shot that Bubba Watson hit to win the playoff in The 2012 Masters. 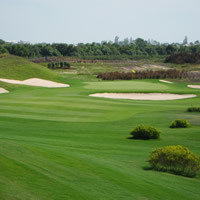 Anyone golfing in Bangkok should have a go at The Royal Gems Golf City. The real 'holes' might be better, but playing the replicas in Thailand? That might even be a better experience than the original from which it has been inspired. Also with knowledgeable Thai caddies, great clubhouse and fantastic atmosphere you've got the makings of a fun day out on the golf course.